FLINT, Michigan — The sign’s lettering had tarnished and eventually its legs were broken, but through a combination of community efforts the Civic Park Neighborhood historical marker was resurrected. Residents, faculty from the University of Michigan-Flint History Department and Flint City Councilman Maurice Davis gathered along Dayton Street to mark the sign's rededication, one of a series of events planned as part of the neighborhood’s yearlong centennial celebration. The sign pays homage to Civic Park’s status as a nationally recognized historic district since 1979. It’s origins trace back to efforts of local residents and the Genesee County Historical Society. Its rededication was in honor of residents of Civic Park past and future. The neighborhood was built by General Motors to house the rush of workers that fueled the automobile industry. Over a 1,000 homes were built just under a year in 1919. Over the years, it suffered from disinvestment and abandonment, and just a fraction of the original historic district remains preserved. The original historic district marker already was showing signs of wear and tear before a vehicle hit the sign a few years ago, breaking its support poles. Davis approached UM-Flint with the project and they began a year-long collaboration including $6,000 worth of repairs covered by the Wyatt Program, an endowment of the UM-Flint history department. 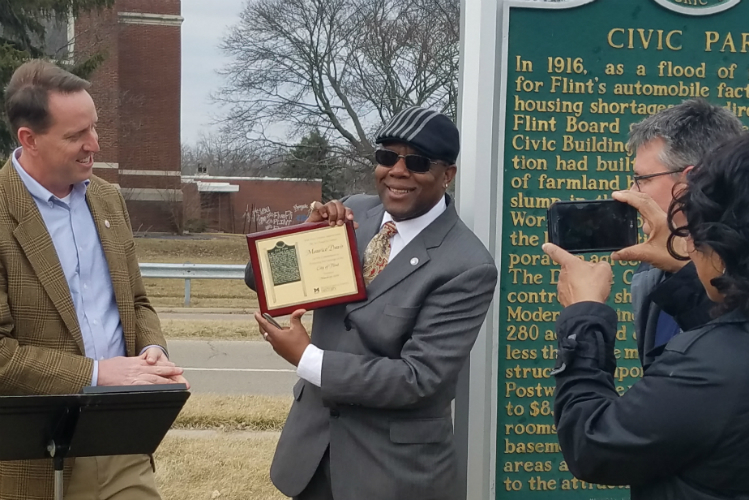 As part of the rededication, Davis was honored by the UM-Flint College of Arts and Sciences for his efforts to renew the historic legacy of Civic Park. Davis has hopes to rehab the entire neighborhood in the future, but sees the rededication of the sign as a good first step in a series of repairs, development, and celebrations. For Davis, it marks the start of equitable development beyond downtown to include Flint’s northside.